The Rats at the Shrine of Remembrance, Melbourne. 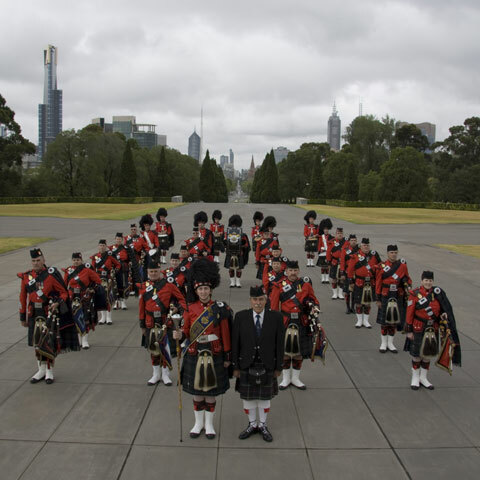 The Rats of Tobruk Memorial Pipes and Drums was formed in 1960 as a ‘Living Memorial’ to the Military Units involved in the Siege of Tobruk of WWII, April to December 1941. The Band has performed seven times at the internationally acclaimed Edinburgh Military Tattoo, in 1988, 1994, 1997, 2001, 2005, 2008 and 2012, and has had the honour to field a number of Lone Pipers for the Tattoo, including Bruce Macfarlane and Lois Cairns. In 2007 the Band performed at the inaugural Russian Kremlin Zoria on Red Square, Moscow. In 2009 the Band was invited to appear at the Libyan Military Music Festival. At the conclusion of this tour in September 2009 the Band travelled to Tobruk to hold a Memorial Service at the Tobruk War Cemetery. The Band performed at the Edinburgh Military Tattoo in 2010, held at Sydney Football Stadium and in 2016 at the Royal Edinburgh Military Tattoo held in Melbourne at Etihad Stadium. In 2010, 2014, and 2018 the Band performed at the Basel International Military Tattoo in Switzerland.